One is hard pressed to find any trace of a genesis or continuum of Apostolic Doctrine for the Trinitarian view in either the Hebrew Torah or its attendant Prophetic literature. All OT references to God are absolutely Unitarian and readily describe our Creator as uniquely single without peer or equal. Only in the Talmud or Kabala do we find suggestions to the contrary, and these references are strictly non-prophetic interpolations or interpretations, written by the Hebrew Priesthood after the Babylonian Captivity of 6th century BC. The very first Hebrew to ascribe an equal to God is Paul, who clearly does so without any discernable precedent in Holy Writ. He, or whoever wrote letters ascribed to him, alleges that this is a mystery, withheld from the greatest Patriarchs of antiquity ― who were apparently less worthy than he ― and then he lays claim to a divine office of Apostle to the gentiles; specifically for its long awaited revelation. But nowhere in scripture can we find any prophetic references indicating that believers should wait and watch for Paul’s definitive explanation of the Divine Plan for man’s redemption! These facts do not seem to disturb many doctors of divinity who admittedly accept both Paul and his dogma on faith in this man alone; although numerous rational recantations are recorded in the bloody wake of Pauline factionalists. It seems even to have been a mystery to Jesus (Isa) himself, who gives ample testimony to the contrary in the recorded gospels, and specifically in Rev 22:8, where he makes it clear he is but a man and fellow servant of St. John from the tribe of Judah! So … where did the writer of the Pauline epistles get his ideas? ― From God or the ascended Jesus, who said he would not return until the end ― or from an inflated image of a self-generated mission? That Paul was a zealot is known and that he was a ‘Pharisee of Pharisees’ he says himself. The Pharisees had two sets of books like all good tax evaders: one for public examination and the other for private reckoning. It is the private ledger one needs to audit in order to find precedents for Paul’s assertion. This book is the infamous Kabala. For those readers not familiar with it, I will but briefly mention that it is the chief document for the present global dissemination of occult sciences within the domains of all syncretic esoteric knowledge of magic! It is esoteric Judaism and is pre-eminently fundamental to Free-masonry, Theosophy, Anthroposophy, Satanism, and practically every New-Age Ideology; including various forms of witchcraft, sorcery, Wicca and Astrology. Therefore, if Paul was indeed a Pharisee of Pharisees, he was also an occult master; something Christians are slow to realize or comprehend! This is not without precedent in the history of Prophecy, for Moses himself was an adept from the Egyptian Temple of On, forty years prior to the onset of his Prophetic ministry. This Moses took four decades to prepare for his ministry while the pagan Initiation was washed out of him, Paul took three years. Why the rush? That Paul had difficulty with the doctrines of Apostles who actually knew Jesus is manifest in the Book of Acts, so much so, that Barnabas left his company. Abraham’s Covenant of Circumcision, as expressed by the example of Jesus himself, became a major bone of contention and actually split the embryonic Church under Paul’s tutelage! Paul became a ‘law unto himself’, ostensibly by the divine leave of an unseen witness he claims was the Risen “Christos”! Not one of his peers gave any confirmation that this spirit guide was in fact the prophet Isa (Jesus), though they readily admitted Paul was full of “the word” and blessed with “power”; working manifest signs and wonders. Now, when we consider that Jesus Christ was the ‘common name’ for many a heathen messiah, is it not reasonable to consider the possibility that some ‘spirit’ bearing that name did indeed guide Paul to his drastically opposing views of the gospel of Isa, especially since Paul never knew the Prophet; considering also that Isa plainly stated he would not return until after many false messiahs and teachers would precede his second advent with signs and wonders? For rational people of faith I would expect that this is a reasonable question. Paul is portrayed as a divisive and confrontational man who single-handedly marshalled the first sectarian separation from those Apostles and Disciples who actually knew Isa and continued the traditions of Moses, as did Isa himself. Pauline doctrine also led to the greatest slaughter in early Christian history: when from the 4th and through the 8th centuries, Romanized Trinitarians essentially killed anyone who disagreed with them, after excommunication or censorship failed to stifle the voice of reason. These prototypical Catholics murdered more Christians than all previous Roman persecutions by Pagan Emperors. An interesting fact is that ‘outside’ agitators’ and Nazi Brown-Shirts ― i.e. illiterate monks in hair-shirts  ― often committed the atrocities against dissenting Christians when otherwise not hacking peaceful pagans to death in order to appropriate real estate and funding for wine soaked monasteries and sacred sisters of the cloth! Why would Isa wait until after his Ascension (earthly departure) to reveal this extremely complex Mystery of God only to Paul, rather than teach it plainly while he ministered to the Twelve? Or why did Isa not tell the Twelve that immediately after his departure, he would send from among their contemporaries, a greater apostle to explain everything he himself had left untaught? Why did Isa specifically say he did not come to do away with the Mosaic Covenant (Law), and why does Paul alone, go to such extraordinary measures to apologize for his contradiction of Isa’s very plain declaration? Was Paul with them on Pentecost when they each received a portion of prophetic inspiration as witnessed by all of Jerusalem? He was not! Yet he declares his portion, received privately, was greater! If Christians were to truly reflect upon these extremely rational queries, they would all become Muslims as were Adam, Isa, and Abraham! This authoritative excerpt dates from the 19th century, updated in 1985, and exhibits the Trinitarian imaginative scale by clearly stating there is no OT Biblical precedent and that the formal doctrine is also not found in the NT. The traces of its supposed NT references are extrapolations taken mainly from Paul’s letters. One famous extra-Pauline passage is from the gospel of John 1: 1, and refers to the term logos, which is a Platonic term used in the Greek Mystery Religions. However, this is now known to be directly plagiarized from the Hebrew scholar, Philo, who wrote in the first century BC. Even the translation of the plagiarized text is spuriously accomplished to favour the Trinitarian view, as there are two Greek words used: one for ‘God the Creator’ (which is Hotheos), and the other ‘a god’ (which is Tontheos) referring to Christ. Translators have conveniently expressed both words as God the Creator (Hotheos). Hence they achieved the required precedent of equating Christ with God the Father. Even so, the lesser term ‘a god’ is definitively equivalent to all ancient pagan conceptions for the several Redemptors who were said to be sired by respective paternal divinities. But even this is not the true import of this use of ‘little god’, as I shall explain later. We must return to Philo Judaeus (20 BC – 54 AD), for a brief moment. He was an Alexandrian Hebrew of ancient priestly stock, who made it his life’s work to reconcile the Hebrew Theology with Greek Mythology and Plato’s philosophy. It was he, Philo, who coined the phrase: “the first-begotten of God’ in direct reference to the ‘logos’ being God’s ‘offspring by the virgin Wisdom’. This is taken from his book: DE CONFUSIONE LINGUARUM page 28, re-copied during the time of Isa, and which original predated the copied gospels by at least 200 years! This contemporary temporal relationship and word-for-word inclusion in the NT Canon cannot be ignored or apologized away! It is exceeding evidence of blasphemy rather than divine revelation! This singular fact also unveils the mythical Christian Trinity’s ‘smoking-gun’, unless you wish to include Philo in the cadre of canonized Apostles!? This irrefutable evidence presents us with collusion between the pious latter Church Fathers and their zealous scribes, who either believed the myth or were consciously working for Zeus, another pantheonic Christos! Philo had simply used the typical Semitic allegorical poetry, so common in his time, to illustrate his concept of Allah’s revelatory process. He did this in order to explain Hebrew theology to Greek intellectuals. And feasibly, that is what John also attempted; but the later Church fathers utilized this metaphor to make Isa an incarnate god acceptable to non-intellectual pagan myth lovers, as a conversion tool for power politics! Instead of plainly teaching that the gift of wisdom was ultimately manifest as being bestowed by God upon the final Hebrew Prophet, they taught that Isa was God’s wisdom Incarnate, and thus co-equal with God as His Only Begotten Son, the first and sole incarnate son divinely patented with infinite wisdom because he was God! May Allah have mercy, for I believe many did not know what they were doing. 12) “The reason the Fathers of the church moved the Jan 6th celebration of Epiphany (Baptism of Isa) to Dec 25th was this: it was the custom of the pagans to celebrate on this same Dec 25th the birthday of their sun-gods, and they lit lights then to exalt the day, inviting Christians to these rites. When the Fathers of the Church saw Christians inclined to this custom, their strategy was to set the true Sunrise on this day, and this usage is maintained to the present day, along with the lighting of lights.” Dionysius Bar-Salibi, Bishop of Amida, Syria, 12th Cent. John was on the Isle of Patmos but his spirit was in heaven during this vision, an appropriate venue in which to meet Isa, as that is where he wa, and John also relates he was taken in the spirit. The speaker is identified as the alpha and omega, an appellation referring to Isa as the messenger of God’s truth or Law (see Kittel’s Hebrew Dictionary for the word truth), not as God Himself for Allah has no beginning nor end, but rather as representing Adam as the first prophet of truth and Isa as the last prophet of truth, both specifically sent to the primary prophetic polity, Israel! It’s very plain. Even Paul calls him the second or last Adam. British; applied to a lout or hooligan; from earlier sense, boy; ultimately back-slang for boy • Times: I would not want anybody looking at me to think this man is a thick, stupid, illiterate yob. (1984). Hence the adjectives yobby (1955), yobbish (1972) • Sunday Telegraph: The loony Left should not be confused with that other Left which has been described as the Left of the yobbish tendency. (1984) – The Oxford Dictionary of Slang, John Ayto, 1998. Oxf. Univ. Press, NY. Begotten is also an insertion (interpolation) later removed from the Bible: Deedat, ibid. Essentially a Hindu view of the relation between Atman: the mind of creation, and Brahma: the soul of creation, as well as an esoteric doctrine relating to the Shi’ite conception of the Mahdi and ground for present day Perenialists. This perspective is an archetypal expression of all Mid-Eastern and Mediterranean pagan Mystery Religion, and was transferred to Greek Philosophy as a complete body of thought. 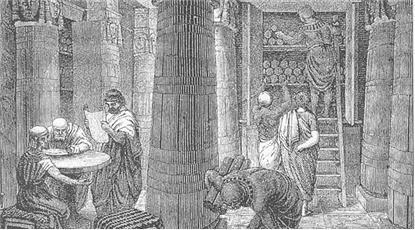 Its Mythraic rituals were actually legally bequeathed to Rome by King Attalus, the Pontifex Maximus of Pergamum in 60 BC. Pergamum, an ancient Phoenician center of human sacrifice, is called ‘The Seat of Satan’ in the Book of Revelation. An Orthodox Christian Priest who expounded his theories from the seat of the Mystery Religions, the Areopagus of Athens, and was a known ‘mystic’ Platonist or Gnostic. Revelation 22:8 clearly states, “I fell down to worship at the feet of the ANGEL who had been showing me ….” then the ANGEL says, “I am fellow servant…”. It was not Jesus who said, “Don’t do that!” And where in any of the surrounding verses does it add, “from the tribe of Judah”? Like the Christians this site criticizes for not reading the text for themselves to find the truth, you yourself skewed the verses to meet your ideology. All credibility in what you say afterwards is lost.